Manchester United's never-surrender attitude got them their 3-2 victory over AC Milan. The way they played in the second half epitomised everything that has been good about United's season. United engineered a quite fantastic comeback and to have won after being behind at half-time is a result beyond their wildest dreams. I'm thinking of the mental side of the game here - when you are 2-1 down against a side of Milan's quality, you could be forgiven for thinking whether there was any way back. Credit to United and their manager Sir Alex Ferguson because the team never stopped going foward in the second half. The key to the winning goal was the stunning pace of the attack - it completely surprised Milan, who just before had had a free-kick at the other end of the pitch. After the break United used width and pace very well and if you do that eventually you'll create loads of chances. Milan hardly had a chance in the second half, but United had lots and lots of chances. Much was made of United's defensive problems before this game, but it would have been much worse if the likes of Cristiano Ronaldo, Wayne Rooney and Ryan Giggs had been absent. As long as they have those players United will always have a chance. It will be interesting to see if Gennaro Gattuso and Paolo Maldini, who went off injured, will be available for the second leg. United showed they can really get at Milan. Milan will have to force the pace next week, but United will be able to sit back and hit them on the break. And will that strategy enable them to contain Kaka more effectively, because he will not have that extra room he had at Old Trafford? 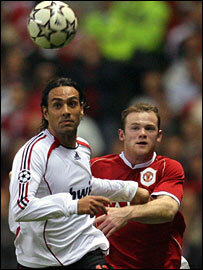 Ironically, United might find it a bit easier to contain the Brazilian than they did in this game. Milan looked very reliant on Kaka. It is very strange because they are a team that play without a centre forward - very strange. That is incredible for a team of their wealth. United have a good chance to get through. You will always have a chance with United's front three players. It is perfectly set up for the second leg. Mark Lawrenson was speaking on BBC Radio Five Live.